After the election what do we do next? This is the question that for me has been banging around in my head for last 2 months. It seems unbelievable to me that we are living in a Britain that is governed by a Tory majority after the 5 years that we have just been through. This morning the press is alive with discussion of how in the ‘emergency budget’ on July 8th, the day when he will announce £12.5bn cuts to welfare and hit the very poorest, George Osborne will in the next breath raise the inheritance tax threshold to £1million; a move that the Institute for Fiscal Studies have stated will ‘most likely benefit high income and wealthier households’. It is unjust. It is immoral. It is crushing to my world view. I like to believe the best of people and I like to believe that generally people are good and try to do the right thing. I don’t need to write here about the injustice and explain it to you. If you are feeling anything like I am this morning, you won’t be able to read any more words than I can write for being consumed with anger. 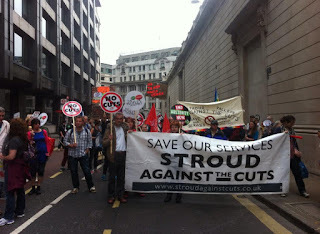 You can join the many different people who will be standing with, and as, Stroud Against the Cuts on Wednesday 8th July, 12:30pm – 1:30pm, outside the now closed Millets store on Stroud High Street. You don’t need to be affiliated to any group. The only thing you need is a passionate opposition to austerity. These protests always seem to be in the middle of what most people would call a work day. If you went out and got jobs, you wouldn't have any reason to worry about welfare cuts. Your post did make me smile, so thank you for that! But you'll note that the protest is actually 12:30pm - 1:30pm which would fall during a lunch hour for a lot of working people. I will be attempting to come to the protest during my working day. It means sacrificing some time that I would otherwise spend on me during my working day; but I think that it is a cause worth getting out for. There are also 1.86 million people currently unemployed in the UK; do you think there are 1.86 million job vacancies out there? What about people who are unable to work through disability? Unfortunately at some point we need to recognise that there are not the jobs out there for people and not everyone is capable of working. Rather than utilising the condemnatory aspects of nature to try to solve the problem we need to utilise the compassionate side of our nature. You will remember that there was £billons available to bail out the banks? Why not bail ordinary people? Excellent blog and comment Alex. I remember our wonderful MEP, Molly Scott Cato, who is also a professor of Economics explaining how Austerity is a political choice - do we want a society that is just good for the rich,and the poor get penalised - or one that all of us can benefit from, where we can share and enjoy helping and being helped by others. The latter is the type of sciety I want to live in, and for my kids and their kids to grow up in. A more equal society is a happier society!